While wandering about Target with the gift card sent anonymously, I chanced across these at the junction of the men's and boy's sections. This produced an audible chuckle and I used my camera phone to take a photo to send to a friend. I stood there for several minutes. They had my size. Like so many people, I'm captivated by the minions in the Despicable Me and Despicable Me 2 movies. I hope the creators are stingy with how they license the characters. If they wind up on everything, their value and attraction diminishes. I almost bought the shirt. After all, I have a $50 gift card in my wallet. But I needed kitty litter and cat treats, highlighters and post-it notes, a new toothbrush and toilet paper. A tee shirt, even one as cute as this, was not on the list and would not have been a good use of the gift card. I think about it, however. 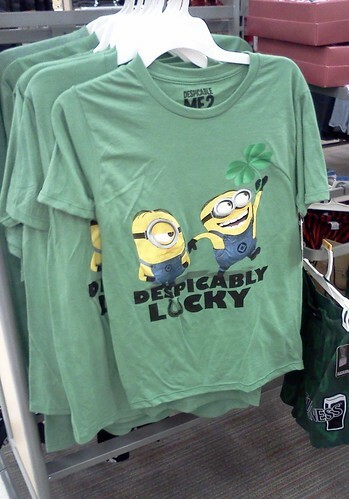 It was created for St. Patrick's Day and is probably still available in the store. (Notice, at right, the Guinness boxer shorts.) It would make me smile to pull it out of the closet and wear, but I have a lot of tee shirts. I passed it by but I enjoy this photo. It makes me smile.